Take a look at the Combi Bowl at the Colorado Springs contest!!! The Rocky Mountain Rampage is Colorado's debut professional skate event in partnership with World Cup Skateboarding. This year's event will feature men's pro vert - on our brand-new public-access, world class vert ramp, men's pro bowl, women's pro vert, women's pro bowl and master's bowl events. The Rocky Mountain Rampage 2012 will take place on August 25th and 26th. A detailed schedule can be found here. All registration for pro skaters will take place through World Cup Skateboarding., and costs $30 per competitor, per event. 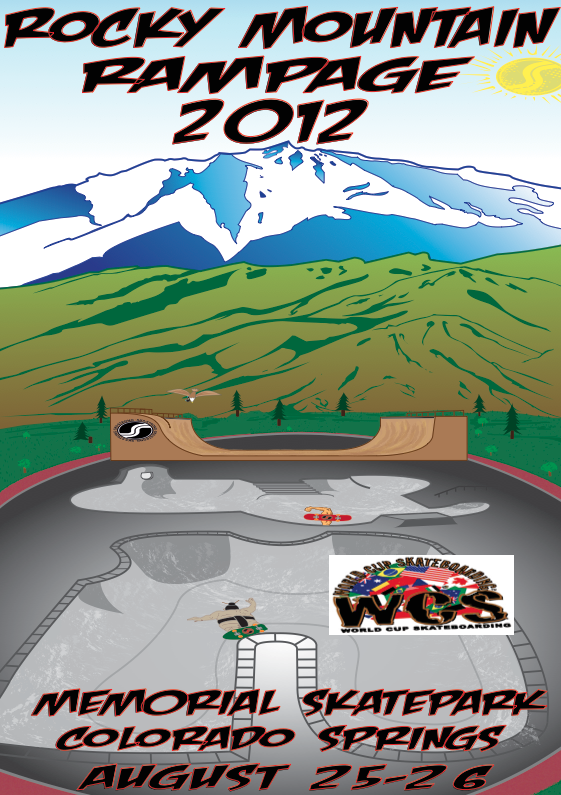 Prior to the pro events, there will be amateur flow bowl and mini ramp events. In the weeks before the Rampage, there will also be an amateur qualifier event (date to be announced), which will afford the top four amateur bowl riders the opportunity to compete against the pros on the 26th. Registration for the amateur events is available on this site and will also take place at Memorial Park during the Rocky Mountain Rampage. Cost of registration will be $10 per person, per event. Advance registration is encouraged as slots are limited. When registering, please ensure you have selected the correct events, as registrations are non-refundable. There will be a maximum of 24 competitors in each amateur event. Airlines serving Colorado Springs (COS) include United, Frontier, U.S. Airways and Southwest Airlines. Tickets from the Los Angeles area are currently running approximately $198 round trip, but the prices will certainly increase closer to the event. We will make every effort to ensure the competition takes place despite possible weather-related issues. If for any reason the weather prohibits outdoor competition, it will be resumed the following day.